Days like yesterday are what blogs are made for. Let me start at the beginning. The weekend started off great. I went to Birmingham on Wednesday night in order to be at events for one of my best friend's wedding on Thursday morning. I was so happy that Ticks (my nickname for Taylor Hicks) won American Idol. Then I got to go to a mansion/the nicest home I've ever been in and lay out all day Thursday with the bride, her sister, cousin, and another bridesmaid. We had a great time. Thursday evening, the bride's sister had a bachelorette party at her apartment and so we enjoyed wine, funfetti cake and rotel before heading out to some sketchy night club in downtown Birmingham. One of the girls at the party knew the DJ and so she got us in for free, which was music to my ears, so off we went. The next day was the bridesmaids luncheon, where we enjoyed Taziki's (my favorite food in Birmingham) and the company of the bride and her family. She gave a short speech about all of us and what we meant to her, using candy to describe the relationship. My candy was a pack of warheads and gum: warheads, because the bride and I used to hate each other. From K4 until junior high, we did not get along at all. In fact, if you'd asked me 10 years ago whether I'd be AT, not to mention IN, her wedding, I'd have laughed at you. Anyway, things changed in ninth grade and that's when we became friends, hence the gum, because gum is longlasting and sweet and relaxing/comforting/familiar, like our friendship is now! That night was the rehearsal and dinner, which was equally fun. The bride's dad prepared a video of the bride and groom's lives and it was fun to watch. Then, of course, Saturday was the wedding. The day was perfect. The bride looked RADIANT, just like the Twila Paris song describes, and she and the groom were glowing the whole day. The reception was amazing, I had a great time with my date, I caught the bouquet (no, I will NOT be the next to get married) and just had an all around great time. I was actually sad when I woke up Sunday because I had come off the euphoria that I was in. You know how when you look forward to something for so long, like the senior prom or your best friend's wedding, and then when it's over, you get kind of depressed? Same thing. That, plus I was once again conscious of the fact that I am nowhere near planning a wedding of my own, even though I would like to very much. To sum it up: I was blue. That is when you might say the weekend hit a turning point. On Sunday, I was out shopping with my mom and sister for stuff for my sister's new house when I noticed my back left tire was a little low. My mom and sister advised me to go get air put in it, so I did. Then I went home and packed up all my stuff and got it ready to load my car. There was a ton of stuff to pack since I was moving into my apartment in Nashville the next day. On Monday, I woke up in an empty house since my mom was spending the day in Atlanta for her birthday. I loaded the last of my stuff into my car with NO room to spare, took a quick shower, ate lunch and went to visit my grandad. I hit the road for Nashville at about 1 o'clock, which is later than I had intended to leave, but not so late that I would get there after dark or wouldn't get everything unpacked, so I didn't care. I decided I was having a bad day when, about 20 miles outside of Birmingham, I noticed that I'd only been on the road 30 minutes and already I was down a quarter tank of gas, even though I had just filled up my car when I left my grandad's. I chalked it up to the overhwhelmingly hot day and the insane amount of cargo I was carrying, but was pissy nonetheless because I was/am tired of paying for gas. I have about 4 or 5 things that need to get paid for by the end of the week and more gas is not high on the list. I had just come over a hill somewhere in Cullman when my radar detector went off. I braked and notice that I had been going faster than I'd meant to, since A. I had just come over a hill and had my foot heavy on the gas, and B. my car was filled to the tippytop with my stuff, therefore accelerating down the hill a little faster. I slowed down anyway and didn't think much else of it, since it was by far not the fastest I've ever gone on 65, and incorrectly assumed that since he was going southbound (and holding up about 50 cars behind him since no one wanted to pass him) he wouldn't bother turning around to get me. Well of course, that is exactly what he did. Flashing blue lights appear in my side mirror out of literally nowhere. I wasn't even sure it was the same cop since I did not even see him turn around or catch up to me. Immediately I start crying, which I try not to do because I've heard it angers cops even more, but this was the straw that broke the camel's back. I prayed that he would ask me to rearrange my stuff so I could have a rear view or something, or at least notice all the crap in my car and feel sorry for me and just give me a warning. He came around and asked for my license, but not proof of insurance. He told me how fast I was going (which again, is not the fastest I have ever gone on 65). He took my license and walked to his car and sat. At that point, I knew he was going to give me a ticket because A. he was not polite B. would be informed about my previous speeding tickets from the dispatcher. I haven't had a lot, but I did just get one in December, and I assume that when you get pulled over again 6 months later THEY assume you haven't learned your lesson and give you another ticket just to make you mad. I contemplate trying to reason with him about how I'd just come over the hill and my car had so much stuff in it, but with my luck for the day, he would have done something else to me for not being able to see out the back of my car or something. I signed my ticket while crying and didn't say one word back to him. Well, as I speed up to get back on the interstate, so do my tears. I don't know why I was crying so much! Again, not the first ticket I've ever gotten and probably not the last. I'm lucky I got one THEN instead of the times I was going +90. I looked at the ticket and noticed that the smart @$$ cop wrote on there that I was using a radar detector and was not able to see out the rear of my car. My anger boiled over, though, when I saw that he failed to tell me - but made sure to include on the ticket - that at the time he caught me speeding, I was in a 55 zone. This made me extra angry because I don't know why the limit there is so low. It's the interstate, for crying out loud. Unless there are workers present, isn't the limit 70? Speaking of workers, there were of course NO workers present, as it was Memorial Day. If I am charged double or extra or whatever because of that, I will meet Officer Smart@$$ in court to contest it. I cry for about another hour as I call my parents, who both are glad I wasn't in a wreck as my crying led them to believe. They both graciously offer to help pay for it and remind me it was bound to happen eventually on 65 as many times as I've driven it now. I also call my friends and ask them to pray that I will not get struck by lightening or get stuck in the elevator at my apartment or any other calamity/misfortune in which fate could engage me that day. I eventually arrive in Nashville and go by my dad's house to get my key to my apartment, which my landlord has mailed to his house. My dad follows me to the apartment and helps me get everything in the elevator and upstairs. I make my bed and begin setting up house when two of my guy friends that live in Nasvhille call me to hang out. I was excited to show off my apartment and spend some time with them so I invite them to meet me at my place. They come upstairs and we decide where to go for dinner. On the same block as my apartment is a Chili's, Logan's, and about 4 or 5 other restaurants. But for some reason, we decide to take my car over to our favorite pizza place rather than walk anywhere. We get about halfway to Pizza Perfect when all three of us decide that the thudding we're hearing is not coming from a motorcycle, another car, or any source other than my own vehicle. I pull over somewhere on Vandy's campus, and as soon as I turn the car off, it hit me: that stupid back left tire. I knew it was flat before I even got out of the car. Sure enough, it was. I started laughing because I remembered telling two of my friends, including my roommate as of Friday, that if one more thing went wrong that day I was moving back home. I did not want to deal with any more problems alone. Luckily I didn't have to, since my two super kind, crowbar weilding friends hit the pavement in their Polos and khakis and changed the tire for me. BOYS ARE SO HANDY LIKE THAT! They knew exactly what to do and were great sports. My favorite part of the situation was joking that the AU grad and the Bama grad were working so well together, and that we PR folks (all three of are PR majors, coincidentally) could have great back-up careers in automotive repair should our jobs ever fall through... or when we decide we'd actually like to make significant money, since PR isn't the most well-paying career. Todd said it was an extension of Better Relations Day 2006. Plus, after watching them... and taking pictures... I am confident that I now could change my tire if it ever again goes flat. I cannot imagine the hell I would have raised if I discovered that flat tire this morning on my way to work, or if it blew out and went flat while I was on the interstate. What are the odds of all of that happening in one day? I hate that my attitude was so rotten over a few bad circumstances, but in my life, when it rains, it tends to POUR. I hope that yesterday is the worst day I'll have for a while. My wallet and I can't handle too much more misfortune. I think I should sell my car and get a bike. I wouldn't get any more speeding tickets, and I bet a flat tire would not cost as much. AND THINK OF THE MONEY I WOULD SAVE ON GAS! Well, my first week at my new job and as a Nashville resident has come and gone and I LOVE IT! I was starting to feel a little sad last week as I realized that I was leaving a city that I was finally beginning to enjoy a little bit. I have been attending a church and singing on the praise team and made a few new friends, so I had begun carving my niche in Birmingham. Just as I was beginning to enjoy home, I finally had an excuse to leave it. But I am sure that Nashville is where I am supposed to be right now. I left Birmingham on Sunday and drove to a friend's house where I stayed last week and will stay the half of this week that I am in Nashville (taking 2 days off on my second week to come home and be a bridesmaid). Since it was about 10 p.m. when I got to my friend's house, we unloaded just a few things and went to sleep. Nervous and not sleepy, I tossed and turned on her futon for a while before finally getting some sleep, even though I woke up several times in the night. So I was a little tired when I woke up on Monday, but tried to cure it with the remaining balance on my Starbucks card. I'm pretty sure there's nothing a Marble Mocha Macchiatto won't get me fired up for. When I got to work, my supervisor came out to meet me and showed me to my office. THAT'S RIGHT, OFFICE. I was sad that all I was allowed to do right then was put my purse in my desk drawer. But I was very pleased with what I was leaving behind: a big desk, 4 real walls, a computer, and shelves shelves shelves. I guess I will have to do real work to get those shelves filled up with binders and books and stuff: people might not like it if I just fill them with picture frames. I spent the day meeting people, learning about my job, going to lunch with my team and filling out paperwork and all of that good stuff. Tuesday, I did more of the same but attended a few meetings and started digging up supplies for my desk. Wednesday was a great day. First of all, by Wednesday, I had figured out exactly how long I could sleep in and still make it to work on time, so I slept in until 7:30, which feels like late afternoon after waking up at 6 a.m. everyday for my internship last summer. It is worth noting, however, that Saved By The Bell reruns come on from 6 to 8 a.m. and getting up earlier than I have to, just to watch those, is not entirely out of the question yet. When I move to a place that has cable, I'll make that decision. Anyway, Wednesday was also good because I wore jeans! I had been eyeing my co-workers' outfits each day. My supervisor was one of many wearing jeans on both Monday and Tuesday, so on Wednesday I decided to jump on that bandwagon. I won't lie; I felt like I had won the lottery as I left the house on Wednesday in jeans. I walk into the office and a man comes up to me to tell me that at the monthly staff meeting that day, the new hires have to make a "presentation." What he means is that the owner of the company calls us up to the front and asks us to do something: sing, tell a joke, do a magic trick, dance, ask us to recite the company's mission statement, etc. I think the initial beauty of doing this is that it embarrasses the new hires. Knowing about it ahead of time gave me and the other girl time to prepare though, and I guess that isn't normally the case. So I strut into the meeting and after the other new girl does her quick "magic" trick, I go up to the front of the room and bust out Auburn's alma mater, understanding that if I have to perform something, I'm not going to embarrass myself any further by performing something I'm lousy at (magic tricks, stand-up comedy, etc). Well, after the meeting I find out that I was the first person to actually ever do something seriously, having been warned and all, rather than just giggle and flounder about, so I ended up being embarrassed anyway for being the girl who took it too seriously and turning the staff meeting into a talent show. Or at least thinking that's what my coworkers thought of me. But I didn't care for long because just after the meeting, a nice little woman from accounting came down to ask if I'd like to receive a massage. The company brings in a masseuse once a week to massage a few people in the company (everyone takes turns), and someone on the schedule couldn't make his appointment so it was offered to me. LUCKY DAY! Thursday was another good day, I got speakers for my computer so now I can listen to my iTunes while I "work." Friday really set the bar high. When I got to my office, there was a Koozie on the desk promoting the agency's third annual Barbecue/Kickoff to Summer Party. At 1 p.m., the agency closed down and everyone went upstairs to the patio for barbecue, adult beverages, and a steel drum player. I enjoyed getting to chat with more of my coworkers about non-work topics: the Will and Grace season finale, Miller v. Budweiser, where I was from, children/grandchildren, etc. I haven't had time to do anything Nashvillian yet, unless you count accidentally missing my exit off of the interstate and taking a detour down lower Broadway on the way to work one morning. Seeing all of the landmarks, like Tootsie's and the Stage and Robert's and the GEC made me so excited that I'm not just there for a night, or a summer, but for as long as I want to be. Years, at least. Unless anyone woos me back to Birmingham. Everyone come visit, and stay tuned for more updates! So, summer is almost here. Not officially, though, and I'll tell you why: my birthday is the first official day of summer AND the longest day of the year! Isn't that great? Eat your heart out. Now that I have a job (PS: I got a job! ), I am beginning to realize that I have to be mindful of my money, meaning I can't go out and buy whatever I want anymore. Not that this was ever really an option for me, but as long as "whatever I want" didn't include a Mercedes or a purebred pony, I found a way to save and get whatever toy/article of clothing I fancied... maybe because I've never had to pay rent. So, combine my upcoming birthday with the list of things I've had my eye on, and what do you get? MY BIRTHDAY WISH LIST! I view this as a purchase to be made not out of want but out of efficiency. I can straighten my hair a lot faster with a chi than I can with my current hair straightening device, which does work just fine. But with a chi, I can expedite the process, which translates into less time to get ready in the morning, which allows for more time to sleep in! And isn't that what life's really all about? I don't even care if its real. In fact, I don't want a real one because I know it would inevitably get stolen. Maybe that makes me tacky. I don't care. All I know is that this little purse goes with pretty much every single outfit in my closet and then some. Talk about efficient: I wouldn't have to waste time transferring my stuff in the morning before work. It's the perfect size to hold keys, wallet, cell phone, iPod, and a bit of makeup. This is a working girl's handbag! This is a great summer/fall shoe that is begging to be bought and worn with my denim skirt. Preppy as they may be, I think I want a pair! It has become really obvious to me that how your eye makeup goes onto your eye, as well as how long it might stay there, depends largely on the quality of the brush one uses to place it onto the eyelid. The Target eyeshadow brushes aren't cutting it anymore. Plus, I don't have enough right now... one poor brush is working overtime as both the highlighter and the pink shadow brush and I think it's getting confused. MAC makes some quality and (compared to other lines) inexpensive brushes... considering I'll use these every day for several years, quality brushes are a pretty good investment. Especially for the working girl. So there's a start to my birthday wishes. If it's not on this list, then it better be cash. 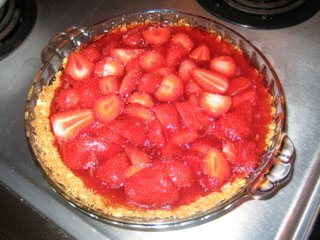 This post is just an addendum to the post I wrote earlier about my untapped baking/cooking skills. 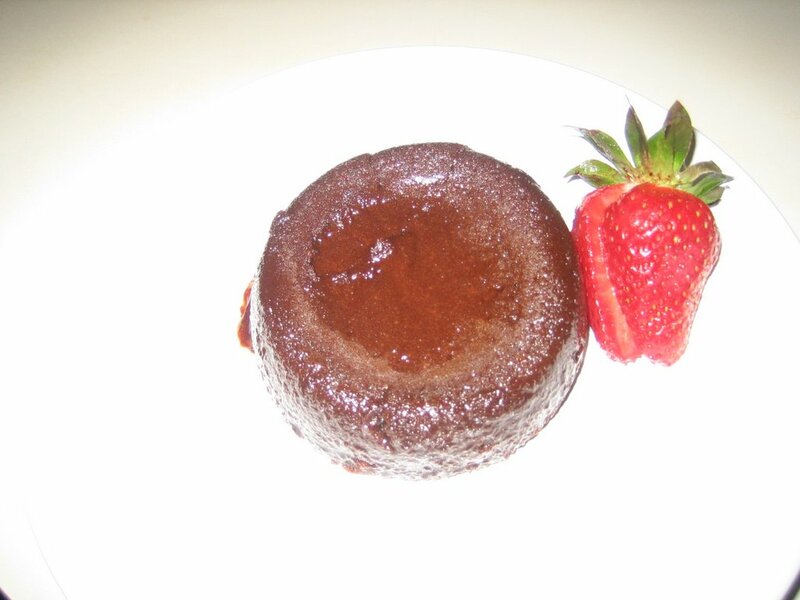 Pictured below is strawberry pie and a mini chocolate lava cake, both made from scratch by yours truly. The pie is especially yummy because even the crust is made from scratch and has an oatmeal/graham cracker/cinnamon taste to it. My grandmother taught me to make it. 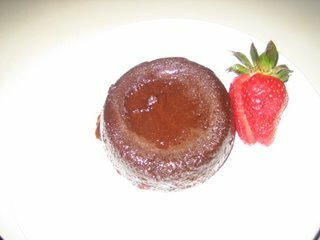 The little cake is the kind with the gooey "lava" center, that when you cut into it, fudge pours out. My friend Katie taught me to make them. DIVINE! Speaking of adept, someone in Nashville finally thinks that I am adept at what I'm trained to do (Public Relations) because I GOT A JOB! I am tickled pink about the opportunity that has been offered to me and am looking forward to being associated with this office. Visitors are welcomed in Nashville!